Before this cold season gets going, get or do the following stuff. Preparation is the key. 7. Keep lemons and limes in the fridge for you water, teas, and infusions. 8. Make vegetable broth and freeze it. 9. Mullein, red clover, blue vervain, alfalfa and Kalawalla organic and non GMO herbs. 10. Irish moss aka sea moss. Devil’s Claw Root Ain’t Evil! What’s in a name? Everything! Yet when it comes to herbs, we have to keep an open mind. Devil’s Claw Root (Harpagophytum procumbens) is a South African herb that brings pain relief like you wouldn’t believe. She’s a warrior root who grows well in deserts and overgrazed soil. She digs her roots in the ground and grows like a champ in these conditions, producing both a deep and secondary root. Her smell repels predators to ensure her survival. She’s gangsta! Rumor has it that inexperienced harvesters don’t realize they should leave the deep root and only take the secondary root to avoid extinction. We need to school them now! Some say her element is fire, others say it’s earth. Either way, she possesses cooling properties that alleviate the heat of pain by reducing inflammation, one of the roots of many diseases. And guess what? This has actually been proven in laboratory studies. I’ve worked with her personally and for my clients when I sold herbal formulas. I prefer to grind and encapsulate the root because the bitter taste can sometimes be intolerable. She’s great for those experiencing any type of pain related to inflammation – arthritis, headaches, and gout are just a few examples. When I struggled with chronic pain that no medical professional could explain, she was my go to. And since she helps with diarrhea, constipation, and flatulence, as well. Her powers are strengthened if you eliminate refined and raw sugar, processed food, and fried food from your dietary lifestyle. Since she has blood thinning properties, she doesn’t mix well with prescription drugs intended to thin the blood. Her name is indicative of her nature and her claw shaped roots. Ironically, this name is associated with the world’s definition of evil yet she’s known to bring protection by confusing her enemies. Her beauty is intriguing yet her protective smell will keep predators at bay. 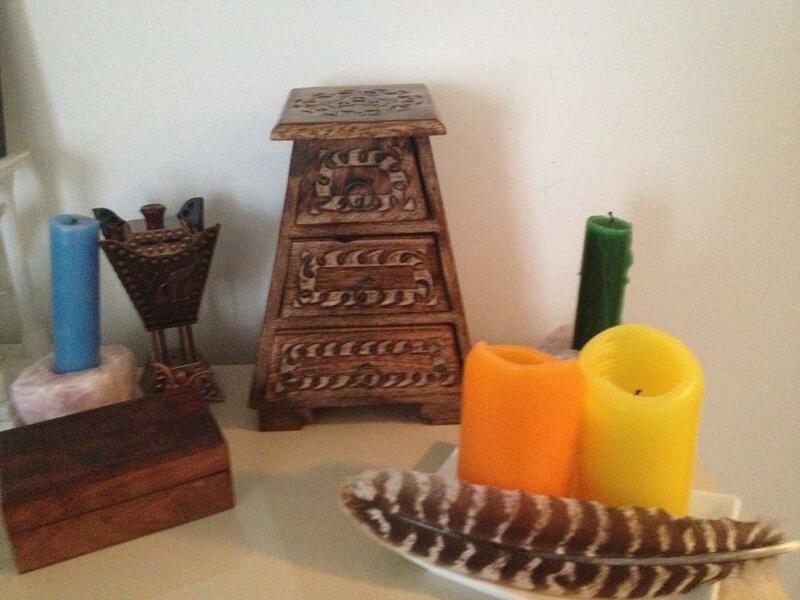 Root workers have been known to place her roots on a piece of burning charcoal to ward off negative energy. I would love to hear your thoughts about this amazing herb. Feel free to share your experiences with her, too. 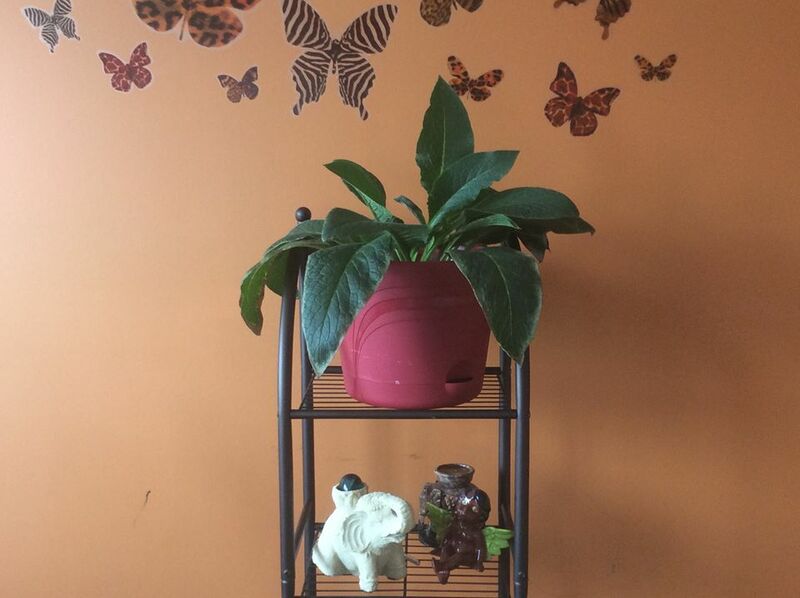 The spirit of comfrey speaks to me daily as I walk by my personal plant. It says, “Sherrice. Grow wild as I grow wild. Grow strong as I grow strong. Saturate yourself with physical and spiritual nutrients, then grow, grow, grow.” I love to hear it in the ethers and I smile when it speaks. This herb will grow in the most harsh conditions and it’s strength begets powerful healing. This green earth plant has mastered the art of growth. Used externally, comfrey is great for healing skin ailments and bone fractures. I’ve also found it to work wonders on sprains, bruises, and burns. In fact, it has been known to reduce injury related swelling. I had the pleasure of ingesting this herb internally as part of a formula I created when I eradicated those pesky fibroids in my uterus. It stops internal bleeding and heals up those places we can’t reach. There’s amazing power in that chlorophyll filled gem. Check out my post about Uterine Fibroids to learn more. So, let’s talk about controversial matters. The wild woman in me likes to defy all odds and dig deeper into forbidden things. I’ve heard the advice against the use of comfrey and I believe my favorite herb in the whole wide world has been the victim of bad research and bad press. I’ve used this herb internally for years and thus far haven’t experienced liver issues, as the studies claim. In fact, I’ve experienced amazing results. Of course, I only use it when I need it. I enjoy an occasional comfrey leaf infusion and get excited about the thickness of the extracts I make. DISCLAIMER – I AM NOT RECOMMENDING YOU TAKE THIS HERB INTERNALLY. That’s just what I do and it happens to work for me. I encourage you to do some research and learn more about this clever herb that works it’s magic to speed up your healing time. Sugar – The Eye Killa! Several years ago, I decided to start a journey to heal my eyes. From 1990-2011, my visual acuity had declined each year. My prescription for eye glasses and contacts was getting stronger and stronger. Then in 2012 and 2013, my visual acuity remained steady. In 2014, something miraculous happened, my vision actually improved. What did I do? I significantly reduced my intake of sugary foods. Typically, a change in your vision is one of the first indicators of insulin resistance or diabetes. But what they don’t tell you is that these conditions doesn’t start overnight. As we eat sugar, especially the white, refined sugar many of us love, our bodies become acidic and full of mucus, the blood and lymph thicken, and our internal organs, including our eyes, begin a slow decaying process. If you want to get old quickly, eat more sugar. I started eating candy, cakes, and cookies like they were going out of style as a young child. Then when I became an adult, I added wine and fruity cocktails to the equation. Of course, all of those foods were full of sugar. In my book, Body by Reeci, I share the gory details of my sugar addiction and the steps I took to overcome it. In fact, the book includes a plan that can help you if you experience this life challenge, too. If you’re experiencing a steady decline in your vision, you just might have too much sugar in your diet. Here are a few tips to consider incorporating into your eating lifestyle to help curb your cravings for for the white demon. 1. Drink gymnema sylvestre herbal tea. This amazing herb decreases the absorption of sugar in the intestine, promotes regeneration of insulin-secreting cells in the pancreas, positively impacts cholesterol levels, helps increase insulin levels, reduces physical cravings for sugar and literally masks it’s taste. In fact, it makes any sugary treat taste rather gross if you drink it prior to (within two hours) ingesting it. Check out a blog post I wrote of this topic to learn more – Gymnema Sylvestre – Sugar Destroyer. 2. Drink oolong tea. This tea has been proven to contribute to reduction of blood sugar. While oolong is a caffeinated tea, it doesn’t seem to have the same addictive qualities of caffeine in coffee. 3. Eat fenugreek seeds. Eating a handful of fenugreek seeds and chasing them down with water is a good practice to reduce cravings in general. It specifically reduces the cravings for sugar. If you enjoy being outside in the summer months, be prepared to share some space with the honey bees. The maple syrup smell of the fenugreek has been known to attract bees. If you’d like to enlist the guidance of a health coach to overcome the sugar blues, I encourage you to visit my website to learn more about the products and services I offer – http://awakenedvitality.com. Peace and blessings. DISCLAIMER: The information in this blog is not intended to diagnose, cure, treat, or prevent any disease, as the information has not been evaluated by the Food and Drug Administration. Herbs and pharmaceutical medicine do not mix so please consult your medical professional before incorporating any of the suggested herbs into your diet. What’s the one of the best ways to nourish your body? Try making an infusion of herbs, the forgotten food. What’s an infusion? A infusion is a concentrated herbal extraction that brings out the medicinal quality of the herbs in a liquid form. Some call this tea, yet technically, herbal tea is not the proper term. Herbal tistane or herbal infusion are the terms we should be using. For the sake of this post, we’ll use the term herbal infusion. When you ingest herbs in a liquid form, they are more easily absorbed into your system. People who make weak infusions or consume herbs in capsule form will not experience the same benefit as those who make infusions because the absorption factor isn’t the same. Absorption is the key to your healing experience so infusions provide a way for this to happen. The nutrients from those infusions will nourish your body to fight off viruses, infections, and free radicals that cause disease. 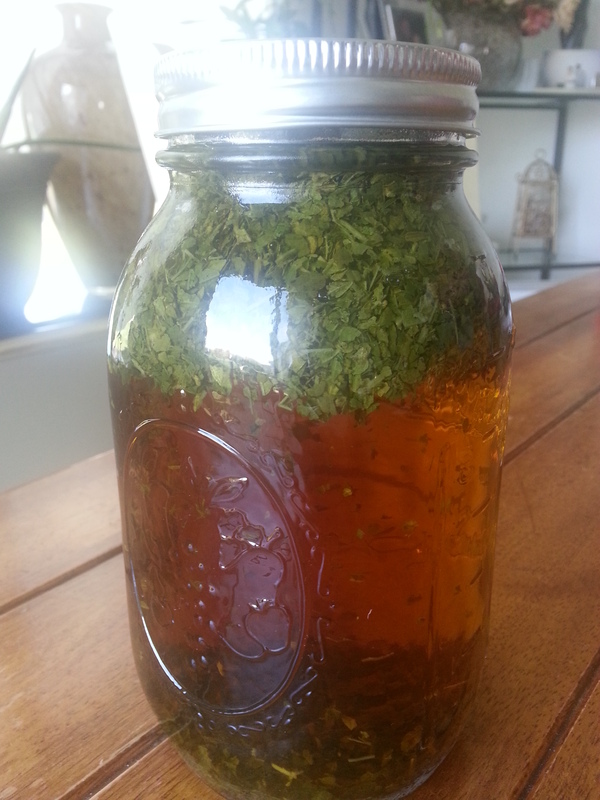 Red clover, oat straw, stinging nettles, and chickweed are just a few of my favorite herbs to infuse. This is a daily practice for me and the quality of my health has improved tremendously. Some folks confuse infusions with extracts or tinctures. Extracts and tinctures are made with water, grain alcohol, glycerine, or apple cider vinegar, depending upon the herb. The steeping time for extracts or tinctures is much longer than that of an infusion. How do you make an infusion? It’s rather easy. Follow these steps to nourish your body with these yummy herbs daily. Boil 1 quart of spring or filtered water in a tea kettle. Remove the kettle of hot water from the heat. Add 1 ounce or so of the single herb of your choice in a large mason jar (1 quart size). Add stevia or raw honey to taste (the infusion is more beneficial with no sweetener). Pour the hot water in the jar. Be sure that it’s almost overflowing so that there’s no air in your jar. Place the cap on the jar. Allow it to sit undisturbed for the allotted amount of time. For a super charge, let it bake in the sun rays on a hot summer day. Any sunny day will do. Strain the mixture to separate the herbs from the liquid. Place it in the refrigerator if you prefer it cold. Sip on the infusion throughout the day. The infusion can last up to three days, if refrigerated. Once you get the hang of it, consider making your own herbal blends. Keep in mind that just like a pair of shoes doesn’t match every outfit, all herbs aren’t meant to be blended, so do your research. Pregnant mamas should consider using herbal infusions to maintain good health and prepare for labor and postpartum care. An infusion of burdock and yellowdock roots work wonders when you need a boost of iron or a variety of other vital nutrients and minerals. Much better than those yucky pills full of synthetic vitamins, magnesium sterate, and fillers that many of us can’t absorb.